8 *New* Mehendi Outfit Labels We Bet You Haven’t Heard About! Avnni Kapoor is one name that is slowly emerging as a brand when it comes to pretty, modern yet traditional lehengas and anarkalis. She uses light and flowy fabrics in most of her designs. Also, her floral lehengas in super pretty pastel shades are to die for! Check out all her designs on Instagram, or visit her store in Shahpur Jat, Delhi. Pooja’s designs stand out amongst a crowd because of their ethnic chic look. She loves pastel colours and zardozi work. The clothes from her line can instantly add a royal touch to your mehendi look and at the same time, they are very easy to wear. You can shop the label here and check her out on Instagram. 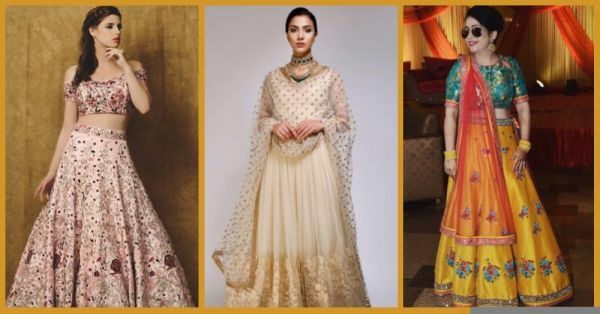 If you want a very pretty traditional lehenga for your mehendi ceremony, then Amaira’s designs are what you should be looking at. They come in some super gorgeous colours, which are just perfect for a day function. The detailing is intricate but light, which enables you to dazzle and chill at the same time! Check out her designs on Instagram and shop for them here. Geethikha is one budding designer who has some fabulous designs in her kitty already. Her designs are trendy and pretty to look at. They also seem to be pretty lightweight and apt for a mehendi function. Take a look at all her designs on Facebook; you will totally fall in love with them. 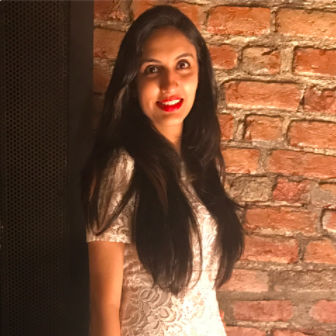 One look at Mrunalini’s designs and you’ll know how much she loves doing her outfits in monotones. Most of her lehengas are in just one colour, or various hues of the same shade. And she totally nails this style. The embellishments and colours work so well together that they are a treat to watch. Look at all her designs on Instagram, and you will know what we are talking about. Akshita’s designs are very elaborate and intricate. You will fall in love with them because of the sheer beauty that they exude. They are everything a would-be bride could ask for. Just lovely! See all her designs here and we bet you won’t be able to stop. Amit’s designs, are a favourite amongst brides, who want to combine the modern and traditional while looking absolutely gorgeous. He often uses traditional fabrics like Banarasi silk and decorates them with embroidery, mirror and zardozi work. Come fall in love with his designs here. You can shop the label here too! These are designs for the soul, really! They are so elaborate and royal, and Mani definitely has a soft corner for pastel colours and thread work. Not just his lehengas, but his suits, shararas and gowns are also elegance personified. If you are a bride who loves extensive designs, then you have to check out his Instagram page. You can shop for his amazing outfits here.